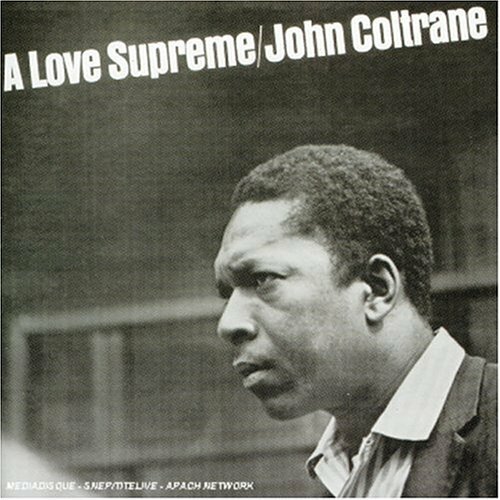 The first time I heard A Love Supreme, I was on a train coming back from MacArthur Airport in Islip, Long Island. I was in my senior year of college and had just watched my long-distance boyfriend board a plane back to California. It had been an interesting and emotional trip, as rushed visits between distant lovers can be. He had told me early on in the relationship that he loved me. It was the first time anyone other than a family member or friend had used that word to describe how they felt about me. It put me in a confusing state of mind. I wanted to tell him that I loved him, too, but regardless of what my emotions were telling me, I felt obligated to understand what, exactly, that word meant. What it meant to him. What it meant to me, in regards to those I felt I had loved in the past, but also in relation to him. I felt like I had to explore what I was acknowledging, what I was committing to, what was expected of me. After an extended visit from him, I was exhausted. And the fact that the confusing Long Island Rail Road schedule caused him to miss his flight didn’t help. He booked another and I rode out to the airport with him. After we parted ways, I hopped back on a train to campus. I was exhausted and selected the “Jazz” genre on my iPod and drifted off to sleep. Eventually, I was awakened by a fast and furious stream of notes from a saxophone. It was A Love Supreme. I had never really listened to it, but owned it because of my jazz history class. Music history courses usually came with listening tests, which I was habitually horrible at. I made sure I owned all of the music from the course so I could listen to it on repeat. A Love Supreme was one of the pieces. I watched the Long Island scenery flash by, perfect suburban houses with yards and swimming pools. I thought about my boyfriend, about graduating, about where I would be in a year. But mostly I just listened to Coltrane. Its complexity and hyperactive energy had a strangely calming effect. When the “a love supreme” chant kicked in, I felt like everything I wanted to know had been explained. Sure, Coltrane was making an ode to his supreme love for God, but damned if it didn’t feel prescient. A Love Supreme, it seemed, was telling me that this was just the way love was, the way life was. Chaotic. Complex. Constantly changing. And that despite the way that might sound at first, there was something lovely about it, too. Since then, A Love Supreme has been the light in dark times. A reminder of the simple facts of life. I heard it last November. It was election week. I had just met someone new, and my brain was in bloom with all of the seeds of thought that get planted in those first whirlwind moments of adoration. And there was the election. Despite what I wanted to believe, I was still nervous that I would watch my country make me feel like a stranger for the third election in a row. I walked through the subway at Union Square, and a man with a saxophone was quoting from A Love Supreme, and I was reminded of that train trip from MacArthur airport. That night, I went home, made myself dinner, and listened to A Love Supreme while I ate. I felt a supreme calm. It’s been months since then, and though the election turned the way I had hoped, there is plenty in my life that remains chaotic, that leaves me feeling uneasy, stressed, out of control. But I have A Love Supreme to remind me that, hey, that’s just how it goes. And that’s okay. This is a lovely entry!